Editor’s Note: There is something to be said for those who are willing to throw caution to the wind and try something new, different, risky, but on the most basic level, incredibly satisfying. This particular interview is with a husband and wife team who did just that. 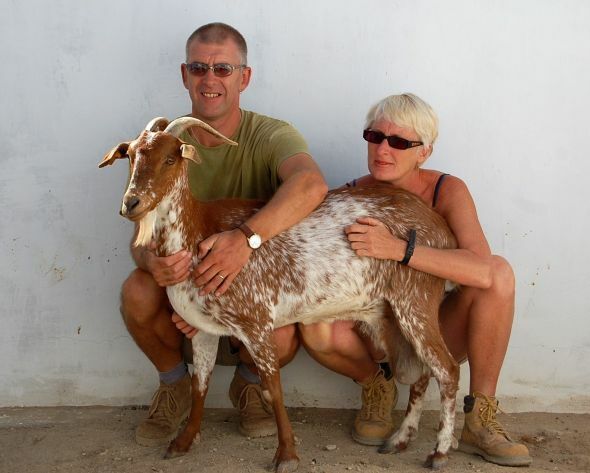 Originally from the UK, Diane and Peter Elliot of “Experience Olvera” are now goat herders in Andalucia, selling goat’s milk at .50 cents a liter. To give you a sense of their hard work, 2-3 hours of milking lends approximately 80 liters, which doesn’t include time spent caring for the goats or their land. Are they living the high life? No. But are they enjoying a very peaceful and simple life that has allotted them time with their grandchildren, a connection to nature and a life in Spain. In much the same vein as many expat winemakers, the Iberian peninsula holds a unique magnetism that brings many of us foreigners to its shores. Few people pack up their life belongings and move to a foreign country, especially to a remote part of Spain. What was the great motivation that instigated this grand adventure? From the age of 14, after a family trip to Valencia, I knew I would one day live in Spain. I had to wait 44 years before I finally made it here, but I never forgot in all those years, the smell of orange blossom, the wild herbs and the people. Life, as it always does, kept getting in the way. Children and exams, elderly parents, but we finally made a date that by 2006 we would move. Along with friends, we bought a large Cortijo and 3 hectares of land. My dream was horse trekking using my two big horses and a friend in Estapona wanted to lend 2 Andalucian donkeys to start me off. The Cortijo (rural estate) had already been divided into 2 houses and we had plenty of out buildings to convert into holiday apartments. Then the dream went horribly wrong. Within 6 weeks of the our trek to Spain, our friends couldn’t cope with living in the campo and moved back to England. In an effort to salvage what we created, we bought them out, but it left us little to renovate the house. Eventually, our neighbor and good friend Antonio, suggested that goats were the only way to go! From your site, you mention that your neighbor gently pushed you into goat rearing as this was both a lucrative and traditional vocation in your new neck of the woods. How insanely terrifying and exhilarating was that decision when you finally said, “yup, I know nothing at all about goats, or livestock, but let’s give it a whirl!”? I have spent the last 7 years learning about goats and building our herd. What a life changer!! The adventures have been numerous from the beginning, which have included: a few near death experiences, being saved by my wonderful Spanish Mastin dog Monty, learning how to work and train water dogs, delivering ‘kids’ (speaking of goats here) from easy to very difficult births, sewn up gashes, splint and mended broken legs, administered medicines orally and via injection…the list goes on and on. I assume you’ve had several life lessons thrown at you in the process. Any you care to share? It is not a life for the faint hearted as we work on average between 13/14 hours a day, unless it is birthing time, which means 19 hours a day. We work 7 days a week, and as any farmer will tell you, for very little money. Last year’s drought hit us very hard, and this year hasn’t been any easier, as the rain has been so plentiful that the river bank burst and took out a 3rd of our newly seeded land. BUT this is living, no rehearsal. I have found at the age of 58, I am more then a Wife, Mother or Grandmother. 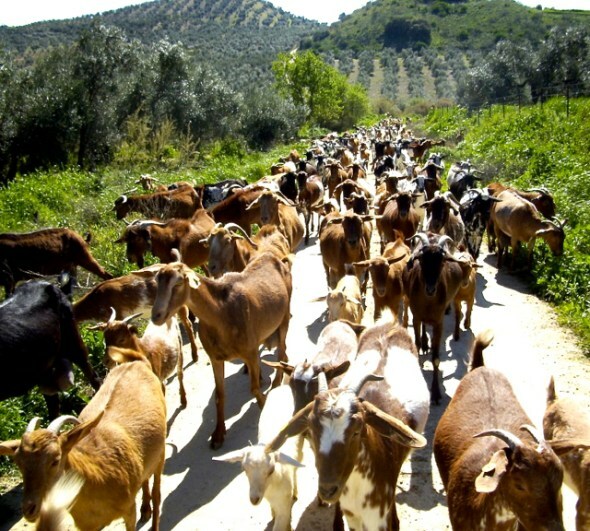 I am an English woman living in Andalucia and a goat herder. You CAN teach an old dog new tricks, life is for living and my God its good to be tested and ask “what am I really made off, can I do this?” The answer is, yes, if your heart and mind is into it, there is nothing that one cannot achieve. Your site mentions that I can sponsor a goat. As my curiosity is thoroughly piqued, what exactly does one get out of sponsoring a goat? This started by friends who read and watched my videos. I have a few ‘special needs’ goats, and they suggested that people help with the upkeep of the special ones. Those who sponsor receive photos, certificate and updates, also videos are being made this year for individual sponsors. My videos are not only about the goats, but the countryside, rivers and hills and meeting other campo workers. The last few years for farmers, as I said earlier, have been very tough, and after talking via the internet to a lady in Australia, who has the same amount of goats as us (50), she had been able to help her goats survive another 3 years of drought through sponsorships, not to mention keep her girls fed. In return, sponsors felt a part of her life. We also encourage our sponsors to “buy a goat for Christmas” for families in Africa. If you had any advice for someone who might be interested in making a similar path as yourselves, what sage advice would you give them? Trust in yourself, because you will find you have reserves and abilities that you didn’t know about. Make sure you have a few ‘pennies’ tucked away for emergencies. There is a Gerry Rafferty song ‘Baker street’ the lyrics are ‘ one more year and we will be happy just one more year and we will be happy’ well for us there is no more Baker Street. We are here, living and feel more alive then ever before. We appreciate Diane and Pete taking time away from their busy schedule and encourage you to help sponsor a goat, or better yet, considering visiting them on your next visit to Spain! Who knows, you just might set up shop as a Spanish cheese monger with all that fab milk available!